Watford boss Javi Gracia. Picture by PW Sporting Photography. Watford's Spanish manager Javi Gracia was pleased with his side's defensive display in their goalless draw away to a 'demanding' Brighton & Hove Albion in the Premier League this afternoon. Both sides played out a dire first-half, but Brighton improved in the second 45 minutes forcing Watford 'keeper Ben Foster in to several first-class saves to keep the game scoreless. The Hornets move up to eighth in the Premier League after seventh-placed Wolves picked up a 3-1 away win over ninth-placed Everton this afternoon. Watford's Spanish boss was left disappointed by a blunt offensive performance, but paid credit to his defenders after keeping Brighton at bay. He said: "In the first-half we had some moments in possession but we weren't aggressive offensively, and only with possession it wasn't enough to create chances. 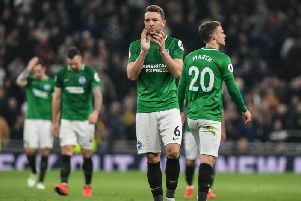 "In the second-half I think it was worse because Brighton played better with more crosses and, as they usually do, more corner kicks where they are especially dangerous. "We've defended well at corner kicks because to defend well against Brighton and all these set-pieces I think is very demanding for our team. "Defensively I think the team was organised and played well but, today, offensively we didn't play well." Hornets stopper Foster was by far the busier goalkeeper throughout the game, making two world-class one-handed to saves to keep out Albion forward Jurgen Locadia as well as producing a fine one-on-one stop to deny substitute Florin Andone at the death. Gracia praised the performance of Watford's number one, but said a display of this calibre by Foster was 'not a surprise'. The Spanish manager also predicted that the 35-year-old goalkeeper can continue to play for a long time due to his 'attitude everyday in training'. He added: "(It's) nothing different than other games. I think in the second-half when Brighton played better was the moment when he saved us but it is not a surprise. "I know he's a very good 'keeper and a very good, important player for us. It's nothing that I didn't know. "In the second-half when Brighton created more chances it was the moment when he played better. "All of you know, maybe better than me, that Ben Foster has a brilliant career and now I think he's enjoying it with us. He's working day-by-day, always with a smile with on his face and he's a very good character. "There is no other secret than hard work everyday, and mentality. His attitude everyday in training sessions means he can play a long term."